Squibs And Crackers: Merry Christmas To Teachers Everywhere! Merry Christmas To Teachers Everywhere! In Texas my 2 sons had a total of 6 teachers. In Utah they have 2 teachers. 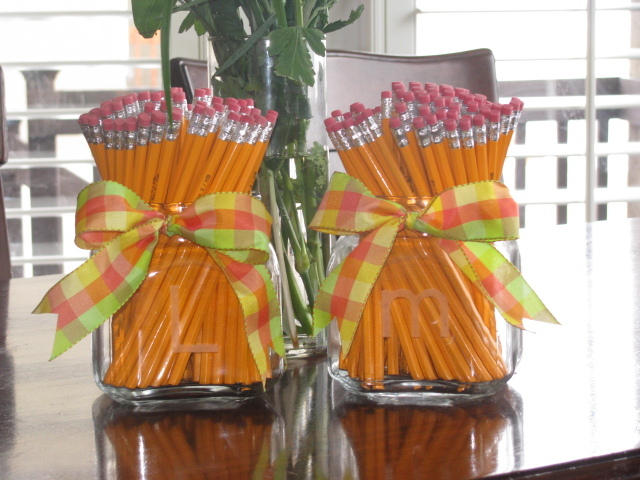 Giving teacher gifts suddenly became much easier on the pocket book! I thought this teacher gift on My Mix Of Six was so cute I just had to do it. Unfortunately I don't have access to vinyl so I etched the glass with the teachers initial. I must say I prefer the vinyl because the etching just doesn't show easily. Let me ask the teachers in my family, Jason and Kira, do I get an A on my teacher gifts this year? They are super cute...and I can't tell you how many times one of my students is sans a writing utensil, so it is always fab to have spares.